How to check email spam score before sending? This free software does it all for you. MailingCheck incorporates all the SpamAssassin rules that you need to respect to go straight to your customer’s inbox. Each of these tests contributes to an overall SPAM score. The higher the score, the more of the individual tests decided that the message was probably SPAM. 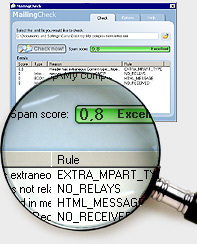 The SPAM score, and a summary of the individual tests is placed in the headers of the message before it is sent to its destination. We included all these spam rules in our free software MailingCheck. Check mailingcheck official website to get more information about avoiding spam folder.